Yesterday was one of those days. Last night was one of those nights. Too much time spent carefully cutting individual pieces. Too much time was spent pinning the work on the wall. Toward eleven I discovered that all of the careful cutting still led to problem areas where things didn’t quite line up. It was one of those nights where I wish more people had been roaming the fifth floor. If someone had, they would have popped their head in the door of the studio and contributed their ideas for how I could more efficiently accomplish what I was doing. That’s as close as this son of a sailor is going to get to using sailor talk. On a related note, the piece is done but no pictures. Before Darien, Drew, Mari and I go out for dinner, I should be able to properly document the piece. In the meantime, I present one of my few and far between attempts at drawing. 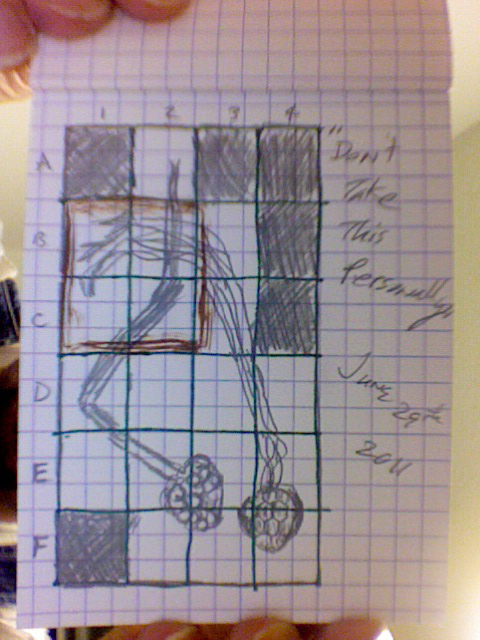 This is a little sketch in my Rhodia pad mapping out where each of the sections should be pinned on the wall. Dark panels represent ground only sections. Brown represents the area I should have started at for attaching to the wall. Crappy image made using the MacBook camera and Photo Booth. This entry was posted in Boston Residency Emmanuel College, Vandyke Brown and tagged Boston, Emmanuel College, kozo unryu, summer residency, Vandyke Brown by Francis Schanberger. Bookmark the permalink.